Storyteller is a woman whose layout depicts what happened after her teenage foster daughter got involved with an older drug dealer in an organized crime gang and ran away. The cluster of events that quickly escalated are depicted along the Timeline. Blue Departure circles on the cards for her partner and other children, in the green Family Zone, of the board show that they were all away at the time so she had to deal with this on her own. Other zone cards depict her spiritual practice and other supports. 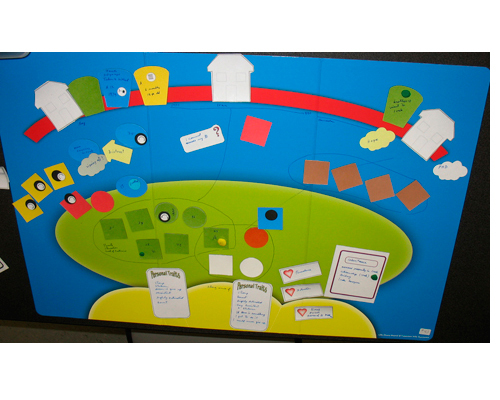 Question, Trait and Field Cards in the yellow Personal Zone were used to explore her inner process during and after the complex situation, which adversely affected her professional status as well as relationships. She used a column of Esteem cards to affirm what she values in herself, and identified resources with green chips. Session with a refugee from war-torn country, now working as a counsellor.. Story boarded in a dyad during a training workshop. He was addressing questions of how to relate to possibly untrustworthy family members still alive in his homeland, and access his family resources there. He has used the black 'death' markers, with the added 'violence' icon on some cards for individuals, and also on a group card for relatives ( blue oval ), with the number of people - 35 - that this represents written on. Another Relatives Group card has a blue 'Departure' icon on it, and writing to show that 17 people were expelled. We also see, along the Timeline, that he was imprisoned for 6 months at age 12. He used the Personal Traits cards to indicate the qualities that have helped him endure and succeed. Session with a childless woman nearing the end of child-bearing age, and agonizing about whether or not to keep trying to have a child. Initially she did not say anything about this topic, and was anxious about the whole process. She had a strong adverse reaction to the concept of the Timeline, and used a Field Card to record what Time means for her. After laying out some of her story, she found, to her surprise, that she did want to talk about how central, and painful, the question of a child is for her. (She still did not want to put many indicators of this on the LSB). She expressed a lot of grief and despair about a miscarriage. She then explored aspects of her personal and family history and attitudes that are influencing her, and saw connections and patterns that she hadn't previously. At the end she felt she had more clarity about which are her own feelings, and which come from elsewhere. Also, although she had depicted some difficult aspects of her marriage, she was excited for her husband to view her lifescape when he came to pick her up. Storyteller is a boy working through his feelings around family difficulties and his parents' separation. The therapist worked with the boy using the LSB over 5 sessions, in an inner city family services clinic. 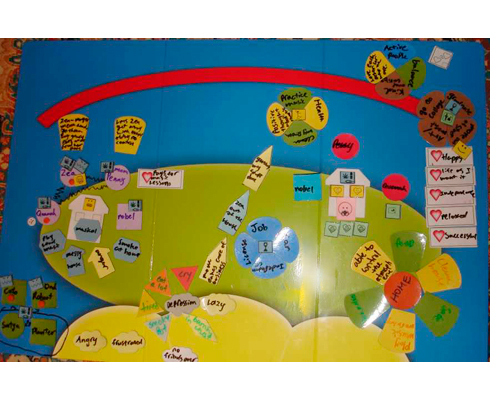 Key actions are depicted on Act Cards along the Timeline. 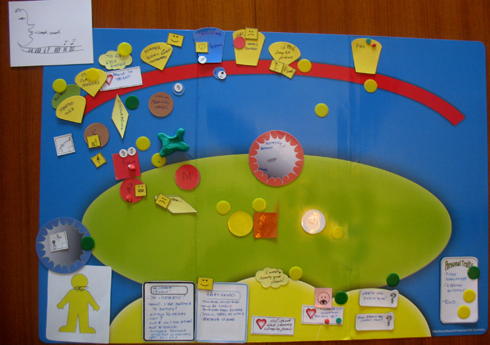 Two households, family members and relevant questions and notes are shown in the Family Zone. 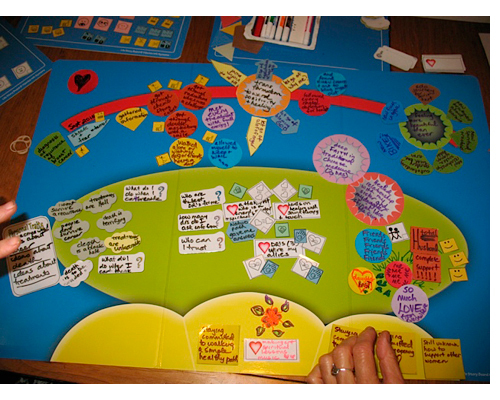 Thought Clouds, Body Map, Qualities Cards and the Hollow Zone are used in the Personal Zone. Session with a woman who was trying to decide whether to buy herself a new high quality piano to replace the modest one she's had for decades. She knew she really wanted to have a good piano, but questioned whether she 'deserved' to. Her discussion of that included a very critical description of herself which she added to a Personal Traits card, as one of her predominant qualities. However, as she then told the story of her early pursuit of musical excellence, it began to be very clear that she has displayed the very opposite of that quality. 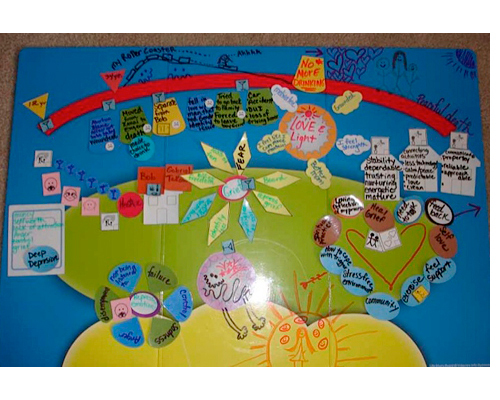 She then used the LSB to explore the origins of that negative belief about herself, and especially to track where it is impacting her life now. She found some surprising connections, far beyond her initial question of the piano. She also realised that this quality that she criticizes herself for has a very positive aspect that she values highly. Storyteller is a teenaged girl very unhappy in her home life. As shown on the left side of her LSB, there is a lot of anger, violence and drug use. Her sister regularly destroys everyone's belongings, and is so noisy and messy the ST can't practise her music or have friends over. Cards in the yellow personal zone show her feelings of frustration, depression, anger and hopelessness. From there, she has identified what she'd like to achieve, the steps to get there, and how she imagines feeling about herself and her life as she does so. Session with a recent cancer survivor, looking back on her experience. She first noted the fears and questions that she'd had to face. Then she focused on all the things she learned about herself, the inner strengths and resources she was able to summon, and the outer support she could draw on. At first she was reluctant to do her LSB because she didn't want to think about cancer any more. But she soon became really excited to see what a transformative journey she'd been on and that she has so many resources and blessings to go forward with. She called the therapist the next day with ideas for more things she wanted to add to her lifescape, and another whole topic to storyboard in another session. This was the first LSB session that this therapist facilitated. 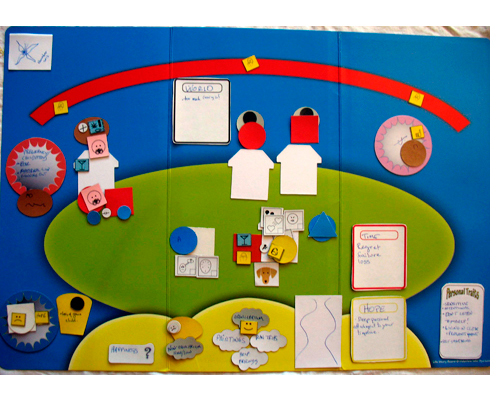 She and the client enjoyed using the components of the toolkit creatively, without worrying about 'doing it wrong'. Storyteller is a woman who wants to get her alcoholism under control and create a more fulfilling life for herself and her family. The left of the LSB shows how she feels about herself when drinking, and a pattern of alcohol use and secrets going back many generations. Event cards along the Timeline depict her history of drinking triggers. 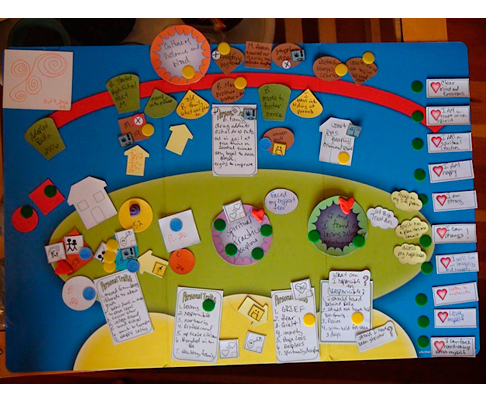 On the right, Dwelling and Role cards show the kind of home life she wants to provide and live in, and a set of cards arranged in a heart identify the supports she needs to help her achieve her goals. 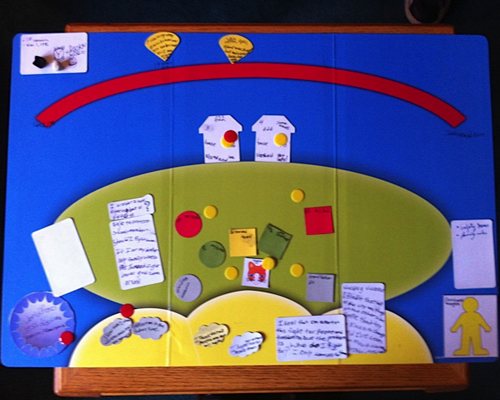 This was one of the first LSB sessions guided by this therapist, so in order to stay with the client's flow, she used the Toolkit components creatively in an ad hoc way when she was unsure about their 'official' designation.